People exhibit many character traits which I find offensive with laziness, apathy, and complacency being a few. However there is one trait that I put at the top of my list of those which truly offend me, that being dishonesty. When someone speaks of honesty most people immediately assume they are talking about not telling lies. Yet there is more to being honest than simply telling the truth all the time…much more. According to Merriam Webster’s Dictionary honesty is defined as fairness and straightforwardness of conduct and adherence to the facts : sincerity. I have few friends and most of the ones I do are people I have never met face to face. Most people I have met face to face have proven to be dishonest to me, and to themselves and that is simply a characteristic in people that I cannot abide. Those who I call friends have proven by their actions that they are honest in their dealings with me and with themselves. You see, a person could live their entire life without ever telling a lie and still be considered dishonest. Have you ever made a promise that you didn’t keep, and I’ll understand and forgive serious problems that precluded you from keeping that promise. But have you ever made a promise and then just blew it off, or forgot? That is a form of dishonesty. So is telling someone you’ll meet them at a certain place and time and then never showing up, or showing up two hours late. Again I’ll forgive someone if something important came up which caused them to be late. But a repeated pattern of being late or not showing up at all indicates a level of dishonesty in their dealings with me that I simply do not need in my life. Those are just a couple examples of dishonesty in how one person deals with another, but there is another form of dishonesty that I would like to take a bit more time discussing; that being dishonesty with self. I find this form of dishonesty to be much more prevalent among people than the aforementioned form of dishonesty. Do you have a job? If so you may be guilty of dishonesty yourself. I know for a fact that I witness this form of dishonesty on a daily basis. When you go to work for an employer and take a job in their company there are usually certain job requirements and standards that you must meet. You are given a paycheck for performing certain tasks to a certain level of proficiency. If you do your job half-assed then you are being dishonest with your employer, you are not EARNING the pay you are getting for the job that you are expected to do. You may not particularly care for your job, in fact you may even hate it, but as long as someone is paying you a salary to do it you should attempt to do it to the best of your ability or find another job. I cannot count the arguments I have gotten into where I work with people about this. They say, and when I say they I am almost exclusively talking about women, that they should not be required to work the same as men do. That’s perfectly fine. I’ll accept and admit that for one reason or another some women are simply not capable of doing some of the things that men can do. But my wife is one of the tiniest people in our plant and she outworks me…by a long shot. But let’s just say that you simply cannot do everything that I can. Then can you honestly tell yourself that you are EARNING the pay your are getting if you don’t do these things? If you can’t, or are unwilling, to do the tasks that the job requires than maybe you should move to a position within the company where you are not expected to do so. If that results in a corresponding loss of pay then so be it. But if you are in a position where you are expected to perform at a certain level, and you don’t, then you are being dishonest with your employer. On the flip side of this if you are an employer are you being honest with your employees? Go back if you must and read that definition for honesty again before I proceed. Do you treat your employees fairly? Do you give them the pay that is deserved for the amount of work being performed? Do you create a work environment that fosters a sense of contribution and fulfillment? Or do you treat your employees as mere expendable items to be used and replaced when they have been worn out? I love my job, I truly do. But there are times that I see others who don’t and therefore refuse to do the things this job requires. Do you want to know what happens in scenarios like this? What I have seen is that those who do like their jobs are tasked with picking up the slack of those who refuse to do their jobs up to standard. Now this could be due to the Union mentality but I also see it as a company policy of all that matters is the end result; that the end justifies the means. As long as X number of cases are packed at the end of the shift it does not seem to matter how hard they work the hard working employees, (while the lazy ones get by with not doing their job) to get their precious standard. That’s just how I see it. I could be wrong, but if I am they haven’t given me ample reason to prove otherwise. Then there are double standards, a form of dishonesty that I truly despise with all my being. I see this all the time in people. It is okay for one person, or group to do or say something, but when someone else does the same thing there is a public outcry over it. This makes my blood boil. I see this in politics where it is okay if YOUR political party, or office holder, does things that are morally or legally wrong, but when a person belonging to the ‘other’ party does them you get upset. I see this in regards to racism as well. How many times have we seen on the news stories where folks like Jessie Jackson and Al Sharpton have cried out against atrocities committed against blacks by whites? Yet how many times have we seen these two men, and ministers of God to boot, remain silent when black youths commit atrocities against white people? I’m sorry, but right is right. Right knows no skin color, it owes no allegiance to political party, it is right and the standards it requires that we adhere to apply to all regardless of our party affiliation or nationality. And while I’m on the subject of nationality, let’s talk for a moment about immigrants. If you are a person who has come to live in this country from another country can you honestly say that you love America, that your loyalty is to America? Or do you come here just to take advantage of the many benefits that America has to offer, yet your love and your loyalty remains with your native land? If you come to live in this country then by God you should do so because you love the freedom it provides, not because of the benefits you can obtain from it. You are a guest in our land and you should be required to observe our laws and our customs. It is not okay for you to come here and demand that we speak your language for you to get by. It is not okay that you force us to tolerate your customs or beliefs which run contrary to all that this country stands for. If you cannot abide by our laws and customs then you are being dishonest with your hosts and do not deserve to live amongst us. And from immigrants I move on to another, even more volatile subject; religion. I don’t care what religion you belong to, if any. But if you follow a faith are you honest about it? As with doing your job, do you follow your faith to the best of your ability? Or are you one of those who say that they believe in God but throughout the week you live as if you’d never read any of the things Jesus commanded we do, then on Sunday you put on your best suit and tie and go to church. Is that the extent of your faith? Do not the Ten Commandments tell you to remember the Sabbath and keep it holy? Yet how many Christians sit in front of their televisions on Sundays watching hour after hour of football? Honestly, do you believe that God considers that keeping the Sabbath holy? Finally, are you honest with yourself in your own beliefs, be they what they may? Are you willing to stand up for what you believe in no matter how many enemies it makes you? I have been accused of being outspoken, of being insensitive, and of being politically incorrect. If by those charges it means that I am willing to stand up for what I believe in, regardless of what happens, then I stand guilty as charged. What I cannot abide is people who say that they believe in something, yet won’t stand up for their beliefs. I also cannot abide people who hold beliefs then demand that someone else enforce those beliefs on those who believe otherwise. Take for instance those who don’t believe it is our right to defend ourselves or our families. Honestly, if you refuse to take measures, be those measures be buying a gun, or learning a martial art which allows you to defend yourself and your family, how can you expect someone else who has a gun, or has obtained a level of proficiency in self-defense techniques to come into your home and protect you when trouble shows up. 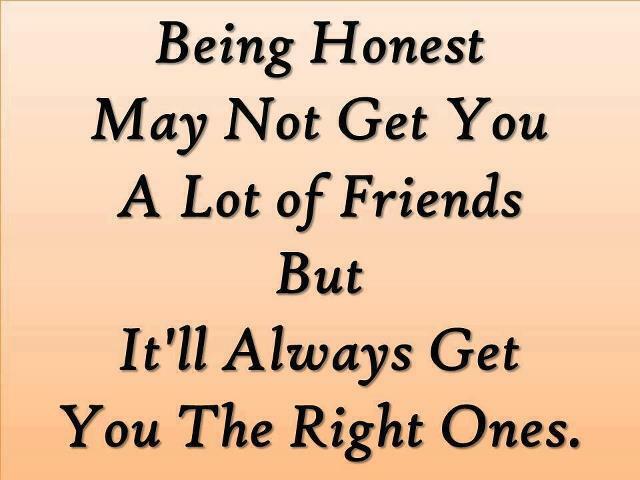 Is that honest in your dealings with those you expect to protect you? Why should anyone be expected to risk their lives to protect you when you won’t lift a finger to protect yourself? That is the epitome of dishonesty as far as I’m concerned. I honestly don’t mean to get your feathers in a ruffle when I say all these things. But sometimes the truth hurts. But if you would be honest with yourself you would see that I speak nothing but the truth here. That is another thing about honesty, being willing to accept the truth no matter how painful it is. I could probably find more examples of dishonesty if I cared to think about it more. But I’m sure by now that I’ve pretty much pissed off everyone, so I will stop while I still have a chance of not being beaten to death for what I’ve already said. But that is why I have so few friends, it is because I find it hard to find a large number of people who are truly honest in their dealings with me, and in their honesty with themselves. I don’t care what you believe in or what you stand for. I only care that you are honest about it and willing to stand for your beliefs on your own two feet without forcing your beliefs on me, or upon others. I also wish that you would remain constant in your beliefs, not saying one thing when the political or social winds blow one way, then change your position when the winds blow the other way. And above all honesty demands that your decisions and your beliefs be based upon facts and evidence. If you are unwilling to examine both sides of an issue, no matter how painful the resulting conclusions may be, you are being dishonest with yourself. And like I said, of all the character traits people exhibit, dishonesty is the one I hate the most. Neal, this post is a learning tool, as it has helped me to see where I need to make corrections with myself. You are right when you say it may piss some people off. It doesn’t me. I found inspiration in this blog in ways to keep myself in check. In then end, you’re spot on about being honest with oneself. Sometimes it takes a slap upside the head for people to open their eyes… some need a series of slaps. 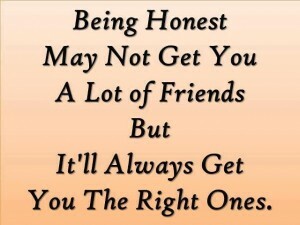 I’ve learned that when I am the most honest with myself, is when I can be the most effective and honest with others.